Fleep for Business - now even more powerful! Fleep for Business – now even more powerful! Our Business subscription is perfect for managing risks – all Business users can sleep soundly knowing they have full admin control over their Fleep conversations. Since launching Fleep for Business in September, we’ve been listening to our users’ feedback and continued to improve the functionality offered with it. 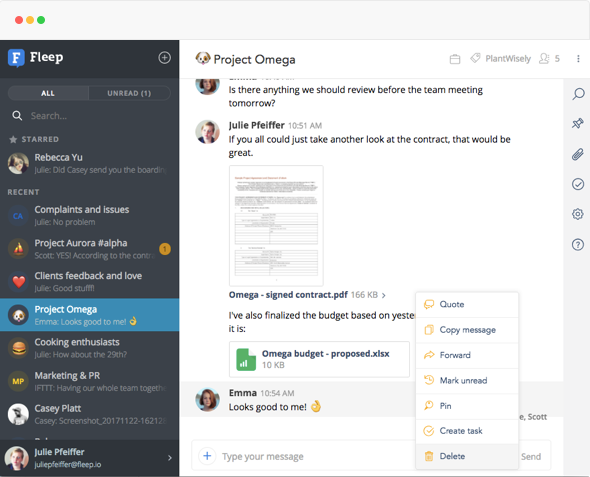 In short, we’ve been adding more advanced features to conversations and teams. Here’s an overview of what we’ve added to Fleep for Business in the last three months. 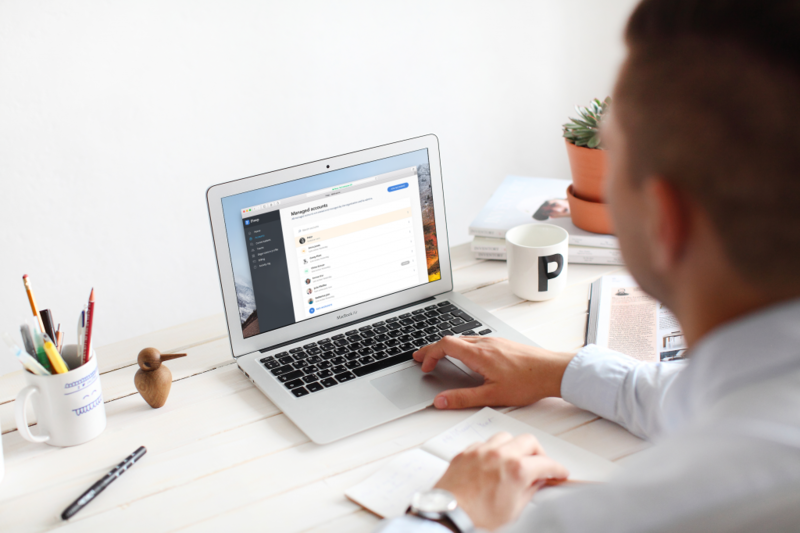 With Fleep for Business, admin rights are given to the creator of the managed conversation – or to the Fleep for Business user who configures the admin control setting. The only requirement is that the member they give admin rights also belongs to the same Fleep for Business organization. All you need to do is find the member actions in the Members list – and click on Make admin. Note that all organization and conversation admins can share the rights in the conversation. The main value of managed conversations is that the admins have control over the membership, settings and message history. However, the limitation that members could not leave managed conversations seemed a little too crippling. We do not want admin controls to create any unnecessary admin overhead – so we’ve made the change and now allow members to leave managed conversations even if they do not have admin rights. This is something a lot of our Fleep for Business users have requested. Now, everyone who has admin rights can delete any message in the conversation. As always in Fleep, this will leave a mark of who deleted the message, as well as who was the author of the deleted message. Please use responsibly. Now, all group conversations, teams and team conversations created by Fleep for Business accounts are created as managed ones by default. This means the creator will have admin rights in the teams and conversations they create. If needed, the admin control setting can always be turned off. Note that all 1:1 conversations will still be created as regular, non-managed conversations. All companies, big and small, have a way of communicating with all of their employees. We like to make sure that such communication can easily be done in Fleep. 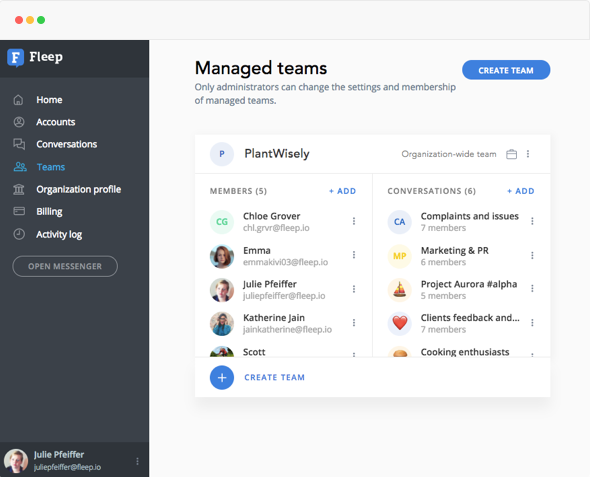 Organization-wide teams are a feature we’ve built exactly for this. 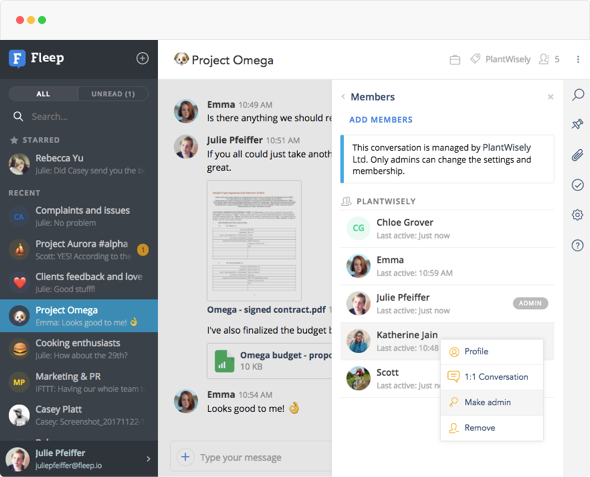 Now, all Fleep for Business organizations have an organization-wide team. That is, all organizations have a team that has all of the organization’s accounts as members, and that membership is kept in sync. With organization-wide teams, you don’t have to worry about whether all of your company’s accounts have been included in the company-wide conversations. As long as those conversations have the organization-wide team added to them, every new member you add to your Fleep for Business subscription will automatically be added to the organization-wide team and its conversations. And vice versa – if you remove someone from your Fleep for Business organization, they will be also removed from the organization-wide team. We’ve gone through a few iterations of receipts in the last few months. Besides the obvious fixes like adding Fleep’s company details, your company’s VAT number and some necessary legal info to the receipts, we most recently also added the Billing period information, so it would be clear what period you have paid for. Do note that previously generated Receipts will not have this info – but if you need past receipts with Billing period info, contact us at support@fleep.io and we can re-generate the necessary receipts for you! Well, yes of course. We are working on quite a few features that we’ll be adding to the Fleep for Business subscription over the coming months. More specifically, we’re working on a “Read-only” mode for managed conversations (where only admins can post messages), and on some some advanced task management features that will only be available to paying users. Stay tuned! We hope you like the direction we’re going in! All feedback and requests are welcome, just shout out at us via support@fleep.io . Let’s also stay in touch through our social media channels. We’re on Twitter, Facebook, LinkedIn and Instagram.